Brief Synopsis – A cavalry officer must perform a dangerous mission but the fact that his estranged son has been assigned to his unit and that his former wife has shown up to make him release his son from service makes things much more complicated. My Take on it – Some times too much of something isn’t the best way to go. 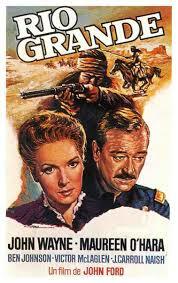 After three consecutive John Wayne Westerns abut the US Cavalry of the late 1800, I think Ford must have gotten tired out by it all because this film veers too far away from the regular cavalry storyline and tries o deal with a sub-storyline of an estranged family and how that affects service of a career army man. Wayne has great chemistry with co-star Maureen O’Hara and they would continue to share the screen together for 7 other films over the years. This film has some great action scenes which are choreographed extremely well and when it sticks to the Cowboys/Indians issue, it’s a lot of fun. Bottom Line – Interesting cowboy story that gets a bit bogged down due to the family sub-storyline. Wayne and O’Hara have great chemistry together. Some nice action scenes that are choreographed quite well. Think Ford got all Calvaried out after this one. Recommended! Genre Grandeur Worthy? – Has an interesting story, but it veers too far from the main story when it tries too hard to deal with family issues.